If you never got around to watching Breaking Bad (aka Malcolm’s Dad Goes Crazy), there’s an episode in the third season called “Caballo Sin Nombre” that features a scene of Walter White getting pissed off and angrily whipping a pizza onto the roof of his house. Since they filmed Breaking Bad in a real neighborhood in New Mexico, fans have apparently been rolling up to Walter White’s old house and throwing pizzas on the roof as some kind of dumb reverse souvenir. Both urged fans to take down the license plate numbers of anyone creeping around the Breaking Bad house with a random pizza box. Vigilante Pizza Justice! My favorite kind. Even though I don’t live in that New Mexico pizza roof house, I’m still pissed as hell at those pizza bandits. How could anyone claim they’re a Breaking Bad fan and waste a perfectly good pizza like that? 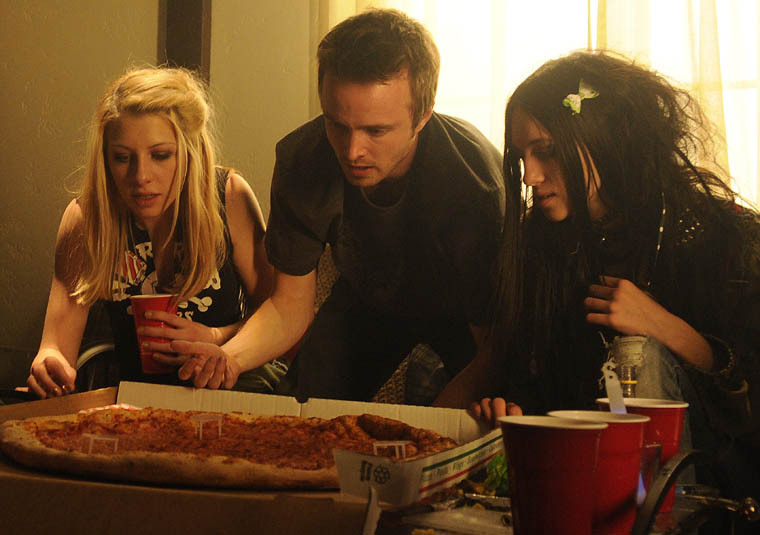 Wasting pizza makes Jesse Pinkman cry.